When it comes to selecting the right studio monitor stand, there are a number of things to consider, including durability and strength, portability, space-saving abilities, and/or adjustability, usability, and cost, to name a few considerations. Studio monitor stands seem too many and the choices can be overwhelming. In the end, they need to save you time and energy and not take forever to set up or be complicated to move around. Whether stands are supporting an instrument, holding a monitor, or raising your speakers a little bit higher off from the floor, the right studio monitor stands can make all of the difference in your music recording space in terms of professionalism. Besides, people need to be able to move around quickly and efficiently. So, you have your desk, your gear, your sound insulating foams, a green room with bean bag chairs, and some studio chairs. Now you want to hear balanced, unobstructed sound with little vibration and no echoing. Therefore, choosing the right studio monitor stands is a key decision. Remember, you want small form, minimalized clutter, and the best position for your monitors, while not disrupting the studio flow. At the end of the day, it is all about the sound. Take a minimalist approach when it comes to selecting the best studio monitor stands – since the stand should not be the star. To this end, the best stands, in our opinion, are both affordable and adaptable, as well as designed for a variety of applications. There are many studios out there all doing the same thing – recording sound. However, they all may have very different requirements in their individual studios than you do. It is then important to remember that what works for one studio may not work for you. Do your homework, take some notes, study the brands and the feature, and then take out your checkbook. 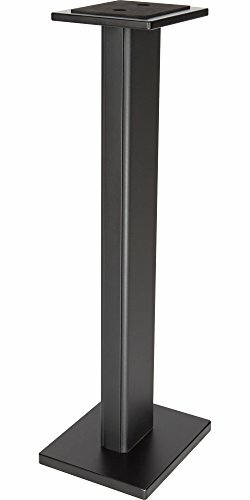 Price - Studio monitor stands go for $50 to a thousand dollars and product come in a wide range of colors and finishes, adjustability, heights, sound decoupling, and portability. If the price is a concern, note that before you walk into the store or hit that weblink. You can always go cheap when starting out and slowly graduate to professional equipment. Height Adjustability - Will your monitors be fixed or will they need adjusting? Will you use them exclusively at your studio desk or will they have other uses? If you only have a small space, you may want a multitasker. If you have a large studio, you may want more than one. Stability - When it comes to matters of stability, you would be wise to consider both the top and bottom bases. Also, lightweight, tripod-style stands, as used with video and still cameras, may be extremely stable, but they take up a lot of room and are not that well-suited for small studios. Many stands now make a more compact, triangle type base and offer adjustable carpet spikes for leveling and rubber feet for smooth surfaces. These make stands adaptable to both hardwood and carpeted surfaces. The Music Critic website makes it a point to stress that the size of the upper plate or shelf is also of great importance. You would hate to have your perfectly placed studio monitor stands to become top-heavy and unsteady. The list goes on to include suitability, maneuverability, sonic decoupling, portability, and general appearance, among other factors. But the main point is to be certain to have a firm concept of what is right for your studio before hitting the stores with wads of cash in your pockets or that shiny new credit card in your hand. Now that we have dropped some mad knowledge with the help of our friends, let’s move on the main attraction. 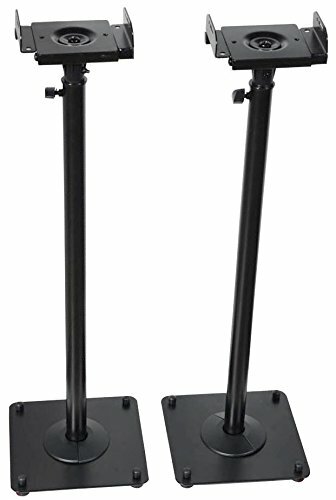 The following list of the 10 best studio monitor stands compiled standouts from other reviews, customer comments, price, and manufacturer reputation. Also, items are presented in no particular order and links to the product can always be found in the description. Ultimate Support Systems is a support systems company that has been holding up the music industry for over 40 years. JamStands are the company’s customizable instrument and monitor supports. 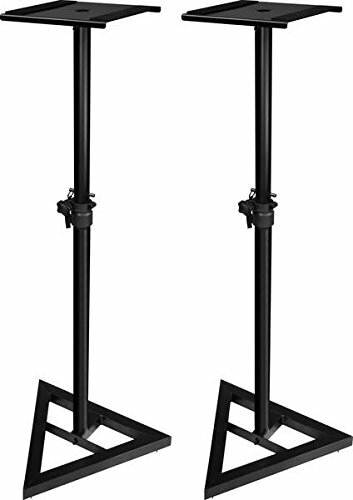 This specific model features a two-pack of adjustable, locking height floor stands with leveling floor spikes, and a slim base dimension of only 229 x 229 mm. This stand can easily be fit into small spaces. Rubber feet are also included for non-carpeted floor. You can find this studio monitor floor stand on Amazon. On the smaller range of Definitive Technology’s ProMonitor speaker line, these study numbers are designed to be fixed speaker holders that will improve you recording sound. Constructed from heavy-duty steel, there is also an inner cable channel for that polished and professional look. Plus, the stands are rugged and industrial looking and won’t take up a lot of space in your studio. The kit comes with spikes and rubber stops for all types of flooring. You can pick them up on Amazon. 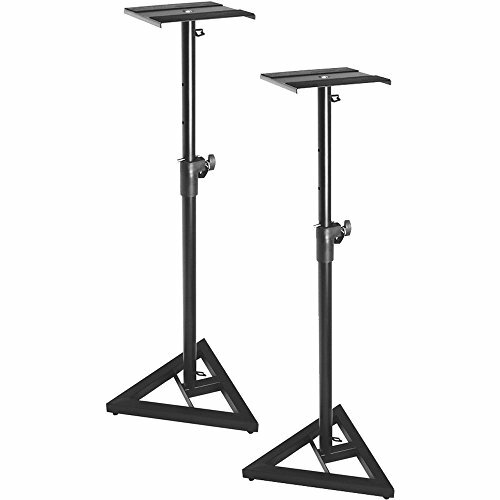 This pair of adjustable stands are extremely budget friendly for the set. But that doesn’t mean you will compromise on quality. 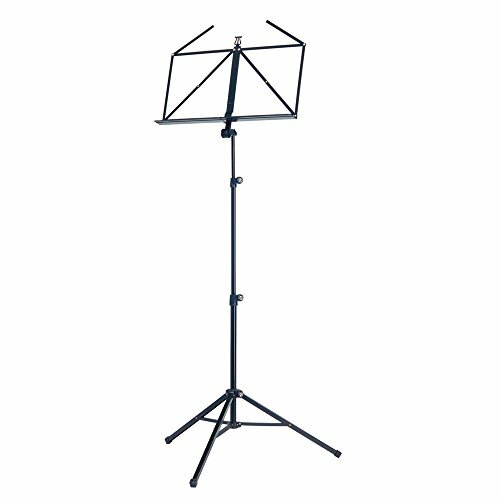 These stands look to feature a sleek design, are made of heavy-duty steel, and can support up to 30 pounds. They are versatile and easy to use and compatible with many of the leading brand of loudspeakers, including Sony, Bose and Acoustic Energy. With an adjustable height, the shelves can also be adjusted by 10 degrees by height and they can pan 180 degrees. The kit comes with leveling spikes and rubber feet, and the cord cavity allows for cables to be concealed. Although these stands can get top-heavy with a lot of weight on the top shelf, for the price, the sturdy construction and adjustability make them worth trying out. This set cost available on Amazon, and the sleek, classic design offers a wood finish, rather than the metal versions that you typically find with the DR Pro SMS1BK Studio Monitor Stand. The hollow design allows for additional weight to be added but even without it, the stands are some of the most stable around. The stands are not adjustable and they are designed at a sitting height of 3 feet. But the wood grain with a fixed height makes it a great monitor stand for any home studio. The stands come with spikes or feet for any type of floor, and the 5-year warranty boasts the quality that went into developing the product. These units are sold as a pair, and they’re durable and classy. This kit will also keep your cables neat with its included clips. 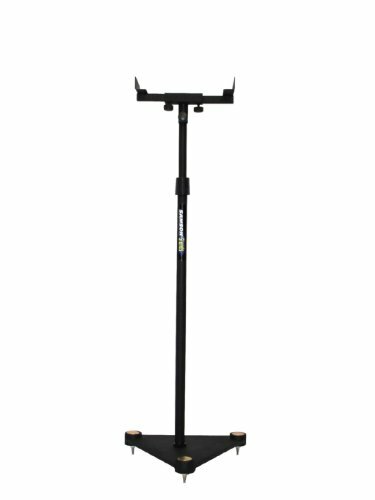 This kit includes two monitor stands with a triangle base and telescoping adjustable column height. Six different heights are available all in all, and they are all secured by a proprietary locking pin. The frame is made up entirely of high-grade steel and includes two vibration-reducing rubber strips that are anti-slip. They provide extra support for any monitor or speaker. Of course, the stands come with spikes and rubber feet. Speaker brackets ensure that whatever you put on the shelf stays put. This Quik Lok stand is a supreme multi-tasker used for a variety of different home and studio uses. Made of top-quality steel and arc-welded construction the entire stand is metal, and you will find no pressboard or plastic in the piece. Plus, the triangular base is solid steel and provides ultimate stability and adjustability with its included leveling floor spikes. The stand is available in multiple finishes, including scratch-resistant, baked on, and non-reflective black enamel. These lightweight monitor speakers designed specifically to be portable, but they are incredibly stable, and the three-point triangle base comes complete with leveling floor spikes. For storage, the stand breaks down into three easy to carry parts pieces, and the stand is rated for 100 pounds, while the special security pin locks the stand at the desired height. Adjustable by height, this set of stands will hold any sized speaker or monitor you can throw at it. 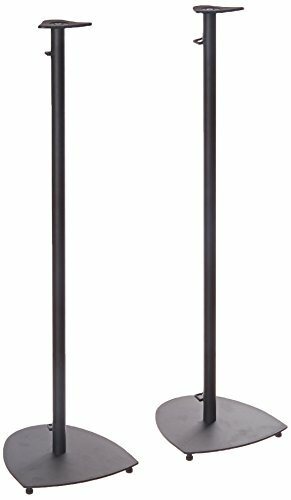 This stand set features a powder-coated steel finish and is height adjustable via a screw-in steel bolt studio monitor or equipment stand. It comes with four feet with anti-resonant and anti-vibration qualities, and the cable management clips keep everything neat and tidy. 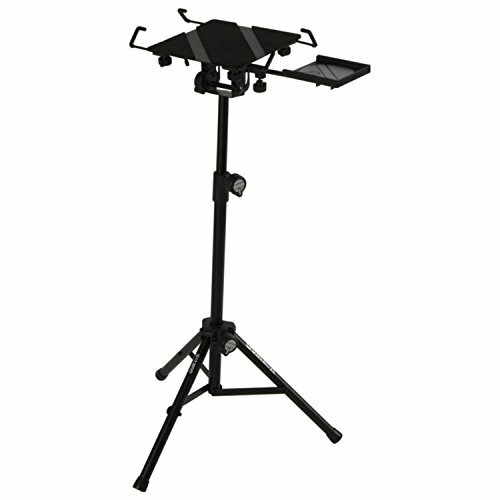 A high-quality steel speaker stand is indicated for professional studio use with heavy equipment. The zinc die-cast clamps won’t snap under pressure. The height is infinitely due to the patented hand crank system and push-button locking screw system. Suitable for lighting bars, speakers, or monitors, this premium stands is available on Amazon. 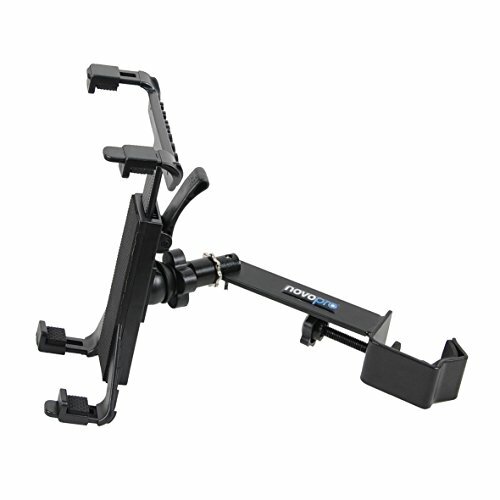 Capable of supporting 100 pounds, the tripod base is extremely stable and the name is trusted by musicians everywhere. This mid-grade set of stands offers a slew of innovations including sonic isolation and decoupling, three separate channels for cable and a ballast, a weight management system, and availability in two fixed heights, 36” or 45”. Plus, the anodized aluminum construction is both durable and lightweight and shelves allow for easy angle adjustment and tilt. 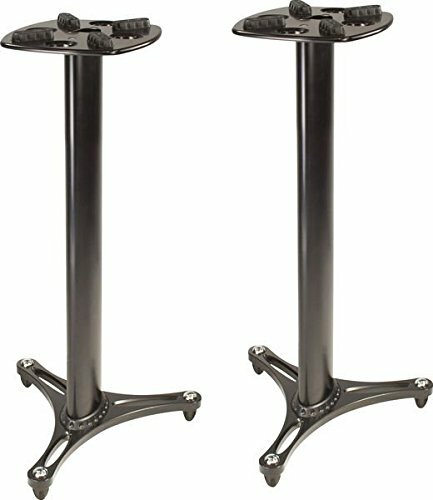 These studio monitor stands are available in black and “classy red” colors. This is probably our favorite on this list, though, as stated, it really depends what you are after. Obviously, the best monitor stands are, ultimately, the ones that meet your individual needs. Affordability, weight, height adjustment, and mobility must be met. Answer questions like “will you be sitting or standing” will go a long way in helping you decide which stand is best for you. Do you need features such as panning and tilting is another question you might want to ask yourself. Are the stands universal or only compatible with certain brands? Will you be using your studio monitor stands for multiple things or will they be fixed in a single position? As long as you go in with a firm idea of what you want and need, it should be pretty difficult to make a wrong choice. Hopefully, we have given you some ideas of what to look for, if not, a list with some pretty great monitor stand choices.